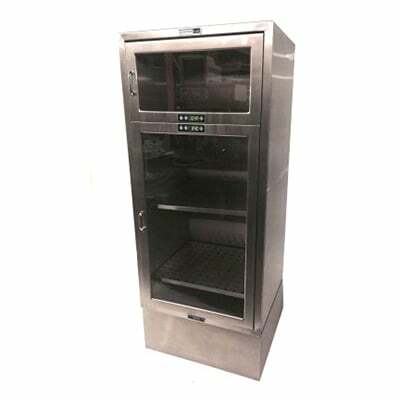 A unique warming cabinet with “look-in” tempered glass doors into two separate, independently controlled, convection heated chambers. 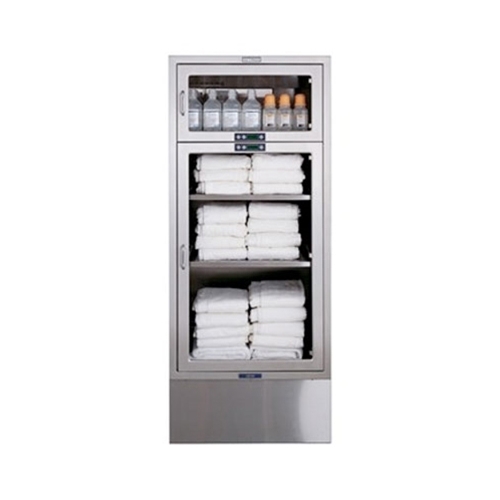 The temperature range in each compartment is adjustable from 90°F (32°C) to 160°F (71°C) and is provided with a “lock-in” feature to prevent unauthorized changes to the temperature settings. At a full 24-inches deep, this model provides maximum storage capacity. Available as a freestanding cabinet with a pedestal base, recessed (with or without pedestal base) or wall mounted. 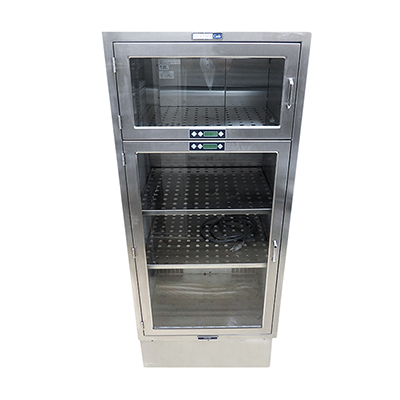 Designed for warm storage of the solutions and blankets used for patient care in surgery, recovery, OB/ GYN, ICU and ER, these warming cabinets offer independently controlled, convection-heated chambers. They ’re available in a variety of sizes and mounting options to fit space requirements. And every Getinge product is backed by an industry-leading team of service professionals. “Look-in” glass doors provide visual inventory control. Large internal volume for storage of solution bottles and blankets. LED display will alert operator of an interruption or power loss. A full 24-inches deep, this model provides maximum storage capacity. Available as a freestanding cabinet with a pedestal base, recessed (with or without pedestal base) or wall-mounted. Individual Compartments: Upper compartment for solution bottles and lower compartment for blankets. Individual “Look-In” Glass Doors: Innovative glass doors allow you to check inventory visually, without heat loss from opening the door. The tempered glass doors are completely safe to touch. Set-Point Temperature “Lock-In”: Control temperatures in each compartment. Set-point temperatures can be locked in to prevent unauthorized changes. Easy to Install: Backed by Getinge service professionals. 90° to 160°F Set-Point Range: Choose the right temperature for your supplies. Control Memory: Temperature set-point values are retained in the event of a power loss. Forced-Air Convection Heating: Warms evenly, eliminating hot spots and scorched blankets. Overheat Protection With Alarm: If the temperature exceeds 10°F above the set-point, an alarm alerts the operator and the heaters are turned off. Heated air is circulated over the load by fans, located in each of the two compartments. The heated air is distributed evenly over the load, achieving convection heating. The upper compartment is capable of holding 20 two-liter square flasks or a quantity of blankets. Two adjustable shelves are provided in the lower compartment which can hold 60 two-liter square flasks or a quantity of blankets. Once the selected temperature is attained, it will be controlled throughout within 10°F (5.5°C) of the selected temperature. A full load of two-liter flasks in the upper compartment will be heated to 110°F within 8 hours or less. In the event of a power loss, once power is restored the unit will indicate a power loss has occurred and resume its pre-power loss state. Questions about our Blanket Warmers? Soma Technology, Inc offers a wide range of blanket warmers and more medical equipment. If you have any questions about any of our blanket warmers or need a quick quote, call 1-800-GET-SOMA and one of our knowledgeable sales representatives will help you.